To read more educational ARTicles like these, subscribe to the Park West Gallery RSS and send a request to receive our FREE monthly newsletter. While modern fine art collectors are seemingly drawn to the beautiful French countrysides of Monet, Pissarro, and Cezanne, this wasn’t always the case. The tradition of landscape painting, in any form, was born from centuries of evolved painting styles, beginning with the tinted walls of the ancient Greeks. Adorning their walls with beautiful gardens and rolling hills was initially common but eventually these scenes became the backdrop for religious stories. Not until the Italian Renaissance in the sixteenth century was this technique revived, brought to height by Leonardo da Vinci’s portraits. 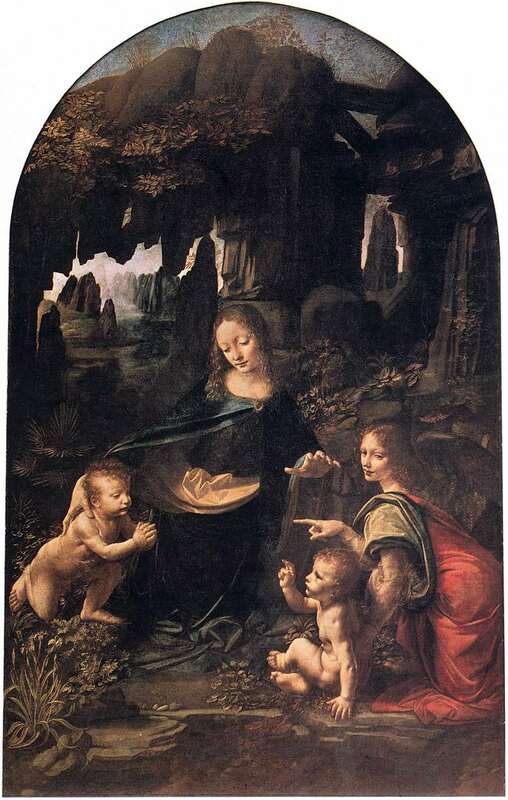 “Madonna on the Rocks” (1492) by Leonardo da Vinci, The National Gallery of London. Leonardo was notorious for incorporating landscapes behind his subjects in the foreground, utilizing dramatic chiaroscuro and rugged terrain, possibly as psychological cues. As the Renaissance revived the classical ideals, naturalistic elements like scenery and landscape sparked a new interest in studying Nature and its importance. Derivative of the Dutch word, landschap¹, idealized landscapes truly began in the Netherlands, the location of a steadily growing population of Protestants that wanted a secular option to the contemporary religious subject-matter. Aelbert Cuyp was one of the most poetic Dutch landscape artists, drawing from his surroundings to paint bright and imaginative scenes. By the seventeenth century, the landscape was perfected, displaying an idealized, classical harmony where Nature was balanced and serene, evoking a classical simplicity. Landscapes were still not the highest form of painting recognized by the royal academies, but they remained popular, steadily growing in importance. Finally, late in the eighteenth century, the Academy recognized landscapes as historic and important, documenting nature as an educational study. This led the way for one of the first genres of American art, using the landscape as a form of American history. 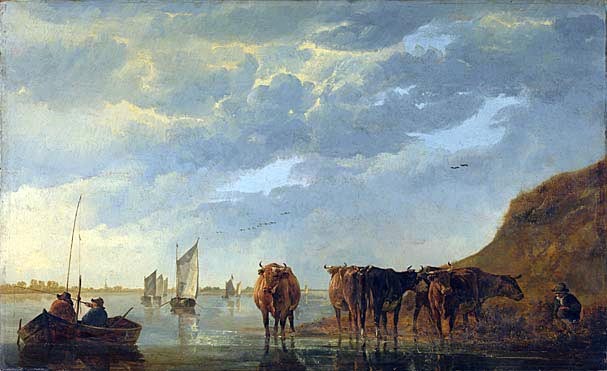 “Herdsman with Five Cows by a River” (1650) by Aelbert Cuyp, The National Gallery of London. When the Hudson River School began painting in the middle of the nineteenth century, they believed that by painting American landscapes in epic proportions (canvases the size of large walls) it could instill a sense of the Sublime. The dramatic vistas and beautiful scenes did two things. Since history painting had been at the top of the artistic hierarchy until that time, yet America as a (European) civilization was just beginning, artists used depictions of the land as its own form of history painting. By doing so, these impressive paintings became their own kind of secular faith, glorifying a fledgling country with the beauty of its lands. Painters like Thomas Cole and Frederic Edwin Church used the vast and open expanse of land to convey emotional and romantic notions of the new frontier. 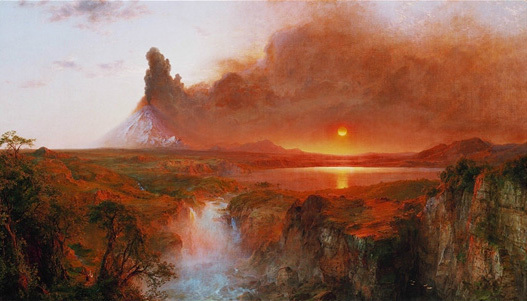 “Cotopaxi” (1862) by Frederic Edwin Church, The Detroit Institute of Arts. By the late nineteenth century, some of the world’s most beloved landscapes were being painted by artists like Van Gogh and Monet, practicing the technique of en plein air, or painting outdoors. Now that pre-mixed boxed paints were readily available, the artists could travel outdoors to paint amidst a more natural setting, further developing the quickly changing social customs and the idea of the weekend. The bourgeoisie could take the train to the countryside on the weekends, escaping the drab of the city. Moments like these were captured by the Impressionists and their contemporaries, documenting this new lifestyle in paintings of landscapes and social scenes. Their modern masterpieces broke ground for today’s contemporary landscape artists like Holland Berkley and Igor Medvedev. “Deep Blue Landscape” (2008) by Holland Berkley, Park West Gallery. 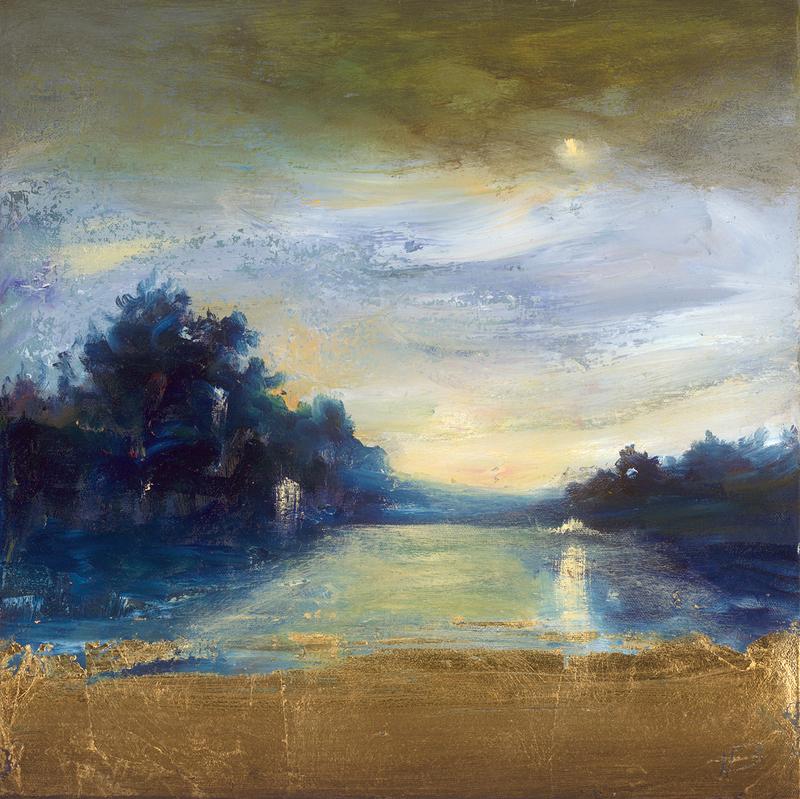 Berkley uses her landscapes to inspire mystery and awe in her viewers, focusing on luminous colors and smoky brush strokes. Her subjects range from bodies of water, trees, meadows, and fields to whimsical portraits and hazy figures interacting with the land. Her studies provide insight to her focus on the honesty of her lines and graphic symbolism. 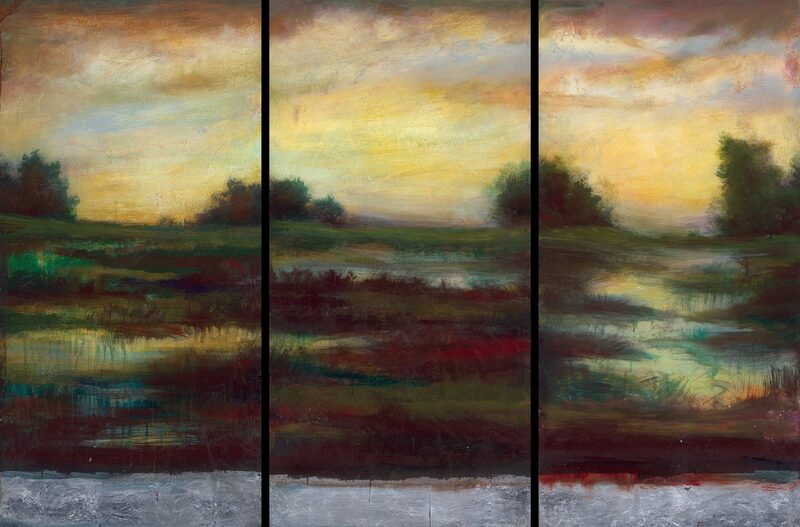 “The Last Emerald Vista III” (2008) by Holland Berkley, Park West Gallery. Igor Medvedev uses his landscapes to document the quickly changing topography of coastal villages. This California artist doesn’t attempt to copy nature in his paintings or to describe in the manner of the photo-realists. Instead, he constructs painterly compositions that direct the eye, moved by their visual drama and hidden mysteries. He describes these hidden instances as “moments of intimation” and aspires to reach “a kind of agreeable unease.” His scenes are landscapes in which he immerses himself – passing moments in Greece, Italy, Spain, Morocco, Turkey, and Africa. Timeless and alluring, these places are captured for his viewers – insight into a world they may never see first-hand – and soon, might be gone forever. Inspired by the rapidly disappearing towns and villages of the Mediterranean and beyond, Medvedev urgently documents with a theme of ecological and cultural preservation, listening to the bulldozers as he paints. Within each piece lingers a sense of balance, wonder, and curiosity, holding the viewer captive as he slowly breathes in the serene colors and harmonies. 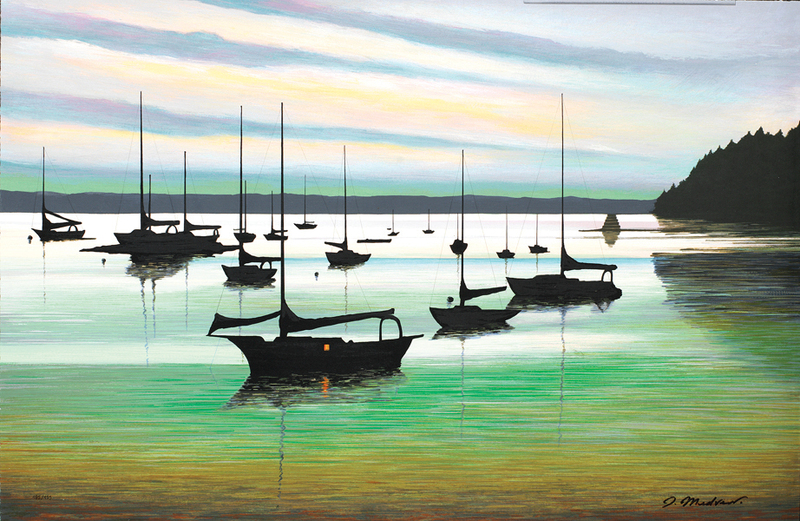 “Emerald Harbor” (2005) by Igor Medvedev, Park West Gallery. 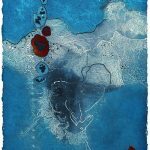 Fine artwork by Holland Berkley and Igor Medvedev is available for purchase through Park West Gallery and its cruise art auctions at sea. To learn more about these and other Park West Gallery artists, please visit our Discover the Artists page and begin your exploration. Great Morning, I just stopped in to go to your site and imagined I’d say I enjoyed myself.